Friday was my last day at Morgan Stanley. I had a great time working there, made some good friends and met some very talented developers. I was there for just over a year and learnt so much in that year. It was quite sad leaving on Friday and I nearly had a tear in my eye at one point (but don't tell anyone ;) ). I'll only be across the road at my new job with HSBC though so I'll still be able to meet up with the guys. 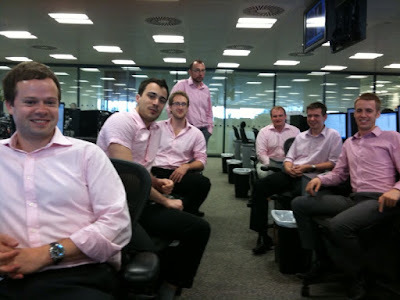 Here is a picture from the last pink shirt Friday. It was the first time I participated as the pink shirt was a leaving present. A special mention to Alex, Ged, Johnny, Ben, Sam, Leon, Tom, Dianne, James, Christie, Nick and Claire. I hope we’ll stay in touch and stay friends. Sad I missed your last day! Hopefully see you soon chap! You should consider becoming a teacher as you were always explaining tons of things to the guys on your left and right sides haha !